Bethesda Sectional Map Amendment H-122 (SMA) for review. 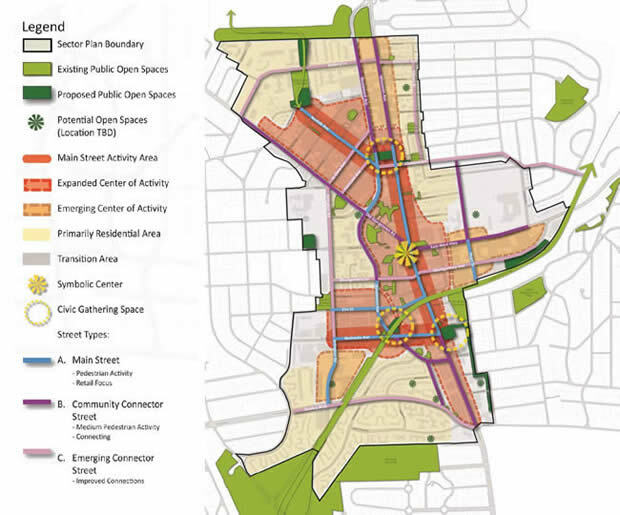 View the pedestrian and bicycle recommendations from the Bethesda Downtown Plan (video). New! Read the latest News Release on Bethesda Downtown Sector Plan Updates. Review the Bethesda Downtown Plan Public Hearing Draft [PDF] (please note the file is large and may take a moment to load). -A mix of housing options, including preservation of market-rate affordable apartments and new moderately priced dwelling units in exchange for development incentives. -New and/or expanded civic greens at Veteran’s Park, Bethesda Farm Women’s Cooperative Market and Capital Crescent Trail. -Economic competitiveness within the region based on new development, public amenities and proximity to transit, including Metrorail and proposed Purple Line light rail. -Density averaging (a planning tool that allows square footage to be sent from one mixed-use site to another mixed-use site) to create or enlarge parks, protect significant community landmarks and retain affordable housing. 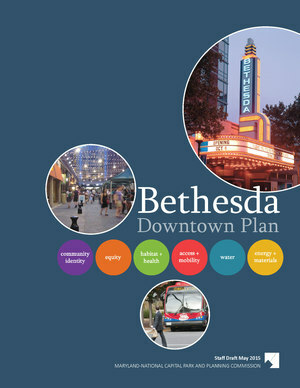 View the Bethesda Downtown Plan Staff Draft [PDF]. Work on the Staff Draft of the Bethesda Downtown Sector Plan began in January 2014. Community participation was encouraged through public meetings and workshops, online surveys and happy hour events, which were intended to reach residents who don’t typically participate in the planning process. The Plan serves as an amendment to the approved and adopted 1994 Bethesda Central Business District Sector Plan and the 2006 Woodmont Triangle Amendment to that Sector Plan. After the Board’s public hearing in June, the plan will be revised through work sessions with the Planning Board before the final Bethesda Downtown Sector Plan is presented to the County Council for approval. Council action is anticipated in the spring of 2016. Learn more about the planning process for the Bethesda Downtown Plan. The Plan Concepts Briefing was presented to the Planning Board on Thursday, December 11, 2014. Thank you for participating in the Feeback Loop. Survey results will be posted here soon. The purpose of the Feedback Loop was to help staff get a general sense of the level of agreement in the community with the direction of the work on the plan concepts. We set up the Feedback Loop so you could focus on what matters most to you and answer a few questions or many, depending on your preferences. This was an informal way for us to hear from you as we move forward on the Staff Draft Plan. Here is theFeedback Loop which also includes the slides. The ‘Properties Under Discussion’ map is about ideas for the longer term future for consideration as we do this sector plan update. We encourage you all to use this map and to continue communicating via e-mail, phone conversations and face to face meet-ups to confer, collaborate and find common ground as we move forward with work on the Sector Plan. This map will be updated as we receive information from property owners. This map, known as the “Development Finder” shows projects that are recently completed or are already moving forward through our Development Review process under the current 1994 Bethesda Central Business District Plan or the 2006 Woodmont Triangle Amendment to that plan. Note that there is a drop down menu where you can select what you would like to view, such as “Preliminary Plans”, “Site Plans”, or “Sketch Plans”. They don’t all show up on the map at the same time. You can see the slides and video from the presentations on October 29, 2014 right here. Help Engage The Missing Millennials ! 26 percent of the workers in Downtown Bethesda are under the age of 30? 30 percent consider themselves to be of a “non-white” race? Willingness to encourage others to sign up for the E-Mail List or come to a future event. List of All Meetings We Have With Everyone . Kick Off Meeting in November 2013 – Photos, Audio, Raw Notes…. Letters: Your Thoughts and Concerns-This section is currently being updated 12/5/14. Meet with us in our offices in Silver Spring, or in Bethesda, or at your own group’s meeting. Contact us to schedule.